This is another one of those “stinky Americans destroyed Earth with their hubris” movies. Well, excuuuuuse us! Can we help it if our super secret defense programs sometimes interfere with the very fabric of the universe? You certainly can’t think that we would have foreseen that trying to draw energy to refuel our planes from some grid that encircles the planet would have resulted in everyone but three ugly New Zealanders vanishing! 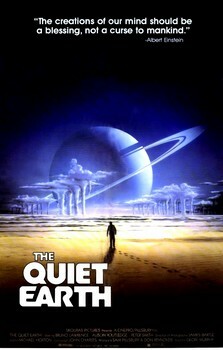 The Quiet Earth, based on a novel by Craig Harrison, once in awhile forgets itself and mentions the complicity of the New Zealand scientists for their participation in the project, but that only crops up whenever the minority New Zealander who survived gets in the surviving scientist’s face with some variation that it was all Whitey’s fault, regardless of what country Whitey happened to be from. Of course, our scientist/hero Zac claims that the Americans kept important information from him so they didn’t really know that everything would be wiped out. Zac certainly had his suspicions though since he was attempting suicide the night that Operation Flashlight got switched on. All of this ought to serve as a wake up call to our military. When doing experiments that tamper with the space-time continuum, do not outsource! Zac wakes up one morning after a night of consuming a great quantity of pills and realizes that something is amiss. He sees no one, cars litter the streets, and airplanes have crashed without any sign of the passengers. It’s almost as if some high level U.S. government project has go horribly awry and erased everyone but him! Now that Zac’s figured out that everything’s pretty much hosed, the part of the movie where he goes nuts begins. This is how all these survival tales go. After figuring out that your old life is ruined, you lose control for awhile, contemplate suicide, live it up, destroy lots of stuff and generally behave like your average college student. In Zac’s particular case, when he goes crazy, he decides that he can finally live out his dream and go around a barren planet wearing only a woman’s slip. He also sets up a bunch of cardboard cut outs of luminaries such as Richard Nixon, Adolf Hitler, and Winston Churchill on his front lawn and proceeds to give a presidential address to them from his balcony. 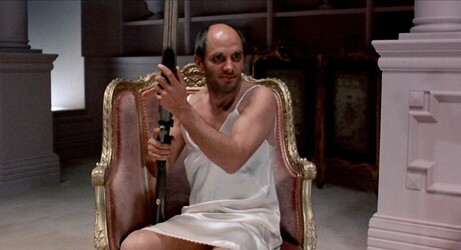 The most egregious combination of symbolism and crossdressing occurs though at a church when Zac runs in there with his shotgun looking for God. Since God doesn’t show up, Zac starts blasting this statue of Jesus. If I’m the only guy left in the world, I can think of a lot things I would do, but vandalizing a church in a dirty slip is pretty far down the list. Luckily, he’s grown out of his transvestite phase by the time he meets up with the only woman survivor of Operation Flashlight. Joanne shows astonishingly bad taste in clothes in spite of having the entire shopping district of whatever big town is in New Zealand at her disposal. If the world has ended, do you really want to be caught up in it wearing a pastel colored window paned pantsuit? Already, I could see civilization receding in the rear view mirror. In the course of their search, Zac gets captured by Api. Api is a Maori and manages to play the race card in spite of the fact that it’s pretty hard to be a minority when all that is left is a woman, a white guy, and a Maori guy. Since there wouldn’t be much of a story if the rest of the movie was about how Zac got dumped by Joanne and was left to go back to driving his El Camino through malls collecting provisions for no reason, Operation Flashlight starts to act up again. The confusing combination of bogus science and thick accents prevented me from understanding exactly what Zac was up to beyond destroying one of the satellite stations involved in Operation Flashlight. I’m guessing though that the way things turned out, it didn’t go according to plan. 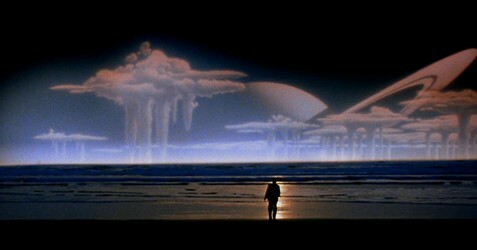 While The Quiet Earth is able to generate a very good deal of atmosphere on a limited budget and the lack of happy ending is to be admired, the whining about how the Americans were at fault, the bickering amongst the characters about everything, and Zac’s feeble attempt to do something about Operation Flashlight hamper things. 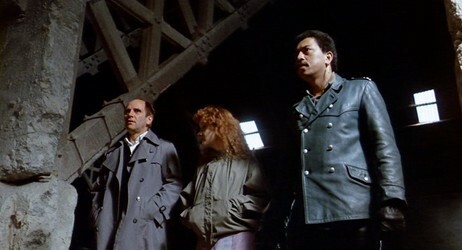 The movie’s rather heavy handed attempts at symbolism as well as Joanne constantly complaining that the other two think of themselves as God also make for some needless slogging by the viewer. An okay post-apocalypse flick that could have been better if the filmmakers would have toned down the self-important posturing and preening and amped up the end of the world survival action.